Tijn Meulendijks is best known for his large-scale, immersive installations that reinterpret and recreate a natural environment within the gallery space. 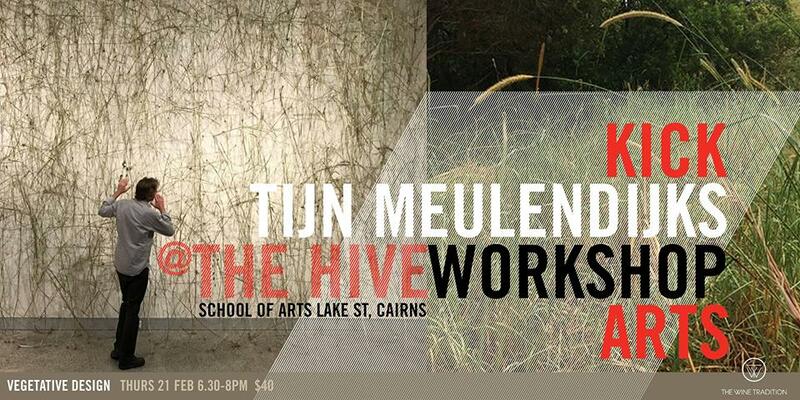 Tijn undertook formal training in Floral Design for eight years in the Netherlands before migrating to Far North Queensland in 2004. Materials supplied: Bind wire, vines & some natural materials, polaroid camera and film to document outcomes due to the ephemeral nature of the compositions. Participants are requested to collect and bring a large bag full of one particular natural plant material, for example: dry leaves, sticks, bean pods ... anything from your or a friend’s garden that you find appealing. Complimentary refreshments are provided for participants. Developed by KickArts Contemporary Arts. Sponsored by The Wine Tradition.